We’ve Raised the Bar on UTI Screening! Introducing CultiPlate®-U, the newest addition to our line of advanced culture products for in-clinic use. CultiPlate®-U is a dual media culture plate optimized for the presumptive identification of the most commonly encountered uropathogens in small animals. What makes CultiPlate®-U different from other screening systems such as Uricult® is the incorporation of our Spectrum™ chromogenic media. When we introduced our first Spectrum™ plate over 10 years ago, we simplified in-house culture by using agars formulated with special chromogens selected to produce uniquely pigmented colonies. 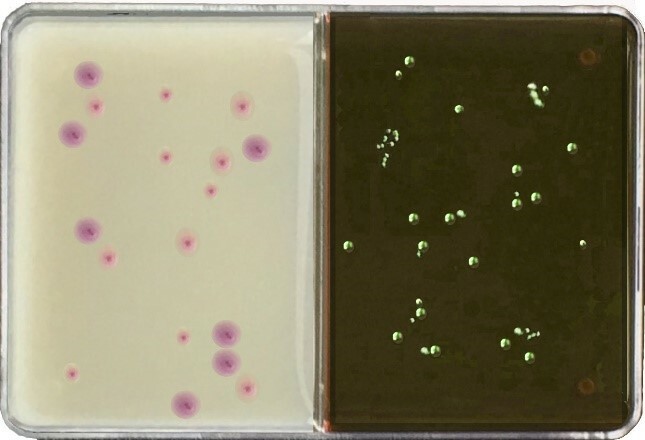 For example, E. coli appears dark pink; Pseudomonas is light green, and Proteus is tan. The resulting colony color and morphology alone provides the basis for presumptive identification. Most organisms will grow out in 18-24 hours and because the colonies themselves change color instead of the agar, interpretation is incredibly easy. See for yourself by clicking here to view our full color chart that will be provided free with your first order. The addition of Eosin Methylene Blue (EMB) facilitates the identification of Gram-negative enterobacteriacae; especially E.coli, the most common cause of UTI infection. Quantitative Bacterial Culture (QBC), also known as Colony Count, is considered the gold standard for diagnosis of urinary tract infections. In addition to differentiating harmless bacterial contaminants from bacterial pathogens, a colony count can provide an important clue as to the severity of infection. For accuracy, QBC should be performed at the time of collection and included in the CultiPlate®-U system are disposable calibrated loops for obtaining precise results. In addition, the compact 2 inch X 3 inch CultiPlate®-U fits easily into the smallest of incubators and can be submitted to most reference labs for confirmation and susceptibility testing. Plates are individually wrapped for extended shelf life of up to 8 months.